We’ve seen a lot of garage door problems during our 30 years in business. In fact, we’ve seen just about every type of issue possible. Here are some of the more common ones we run across on a regular basis. When a garage door sticks open or closed, there are a few different reasons why. Check the battery and sensors on your remote first. If that’s not the problem, try to open the door manually so you can see if there are any kinds of obstructions on the wheel tracks. Another potential cause is that the unit is hanging unevenly for whatever reason. This is one of the garage door problems that needs to be fixed by a professional. If your door seems to shimmy from side to side, it may be due to something blocking the track wheels. If that’s not the cause, then you more than likely have some sort of spring issue. Garage door springs can be extremely dangerous, so always call a professional – don’t ever try to work on them yourself. Any sort of squealing, grinding or screeching noises are probably due to either not enough lubricant or debris or dirt accumulating in the tracks. Try cleaning the tracks – but don’t use a harsh cleaner. There is a special type of oil that is used to lubricate garage doors. If you can’t find it, then spray WD-40 on the tracks as well as the hardware. If the problem still exists, call an expert. 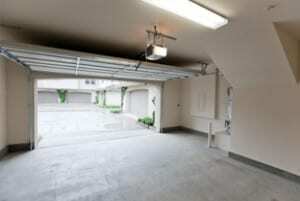 This is one of the most dangerous garage door problems, of course, and is usually due to loose springs or broken cables. Again, you should never try to fix this type of issue yourself. These are just a few of the garage door problems we see frequently at Action Garage Door. If you need help, contact us online or call us at one of the numbers at the top and bottom of this page.